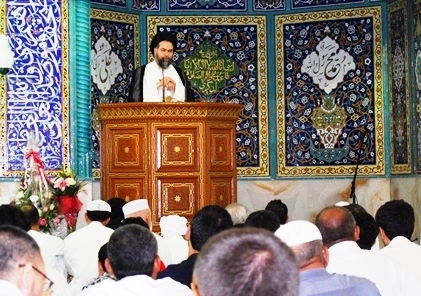 Today the Friday prayer performed by Ayatollah Madani. In first sermon he mentioned that during our life some events happening that are acting like a earth quick and destroys everything. “The faithful Muslims should be patient in happy and sad events in their life” he added. Sometimes the sad happening is so strong and similar to earth quick. As a strong earth quick may demolish the huge towers and buildings and make too many people die and destroy everything, some events in our life may do the same with our soul and destroy strong promises that we had made with our God. The event may be passing away a dear one, a painful and endless illness, poorness, bankrupting and …. He added that in such happening some people choose the worth way to confront and do the suicide and they believe that will get rid of the problems. But Quran and Hadith, clearly mentioning that he /she will receive a painful torment forever. The torment is not comparable with all the world’s disasters and this way is the worst one. He continued that the second group in such events will try to punish others and put the responsibility on others and close relatives like their family and keep them under pressure to release some of their pain and stresses. But they don’t know that the worst provisions that may someone takes with himself is the cruel and oppression to others. Ayatollah Madani added that the third group is those that go toward the drugs and try to forget the problems instead. The sedation of the drugs is a glance and the outcomes are forever. But the faithful people ____select the trust to Allah and to believe that what happens have a grace from allah and we should be patient and wait to the condition to change to better one. He added that he is going to explain the characteristics of a real Shia within couple of weeks and continued that as I told last week, the exemplar Shia first should understand the leadership (Imamat) and after that should know the Imam and third step to be follower of Imam in practice. “Having the social mind and paying attention to others in your around specially to those are weak and poor is one of the main characters of a real Shia” he added. He added that ____having the generosity soul to be able to forgive if somebody asking for excuse is another character of a real Shia. He continued that you should forgive others to expect that Allah will forgive your sins. Then he appreciate for the helps that Mosque received to support for Somalia and Flood in Pakistan. After that Ayatollah Madani noted the Birth day of Imam Hassan (a.s) which is in mid of Ramadhan and suggested to try to be as similar as possible to his characters. Also he added that the Qadr Night is arriving and we should get ready to get the maximum benefit of these nights and remaining days of Ramadhan. “We should be ready for these nights and try to get our needs by moan and request” he added. And finally he prayed that Allah will help us to empower everyone to get the most benefit of the remaining of Ramadhan and our life. Then he had his second sermon in Arabic for Arab brother and sisters attending in prayer.